Cookies on websites have a bad reputation because clearing them is often one of the first troubleshooting steps to follow when you are having difficulties browsing websites. And while deleting these cookies can often resolve the issue that you are experiencing, cookies that are functioning properly are a very important component of signing into your favorite websites, and making online purchases. But since the cookies don’t always function properly, it’s likely that you will need to delete them eventually. 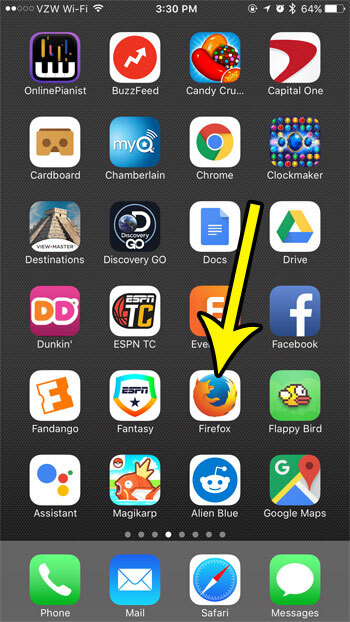 Our tutorial below will show you where to find the menu in the iPhone Firefox browser that lets you remove the stored cookies from the browser. 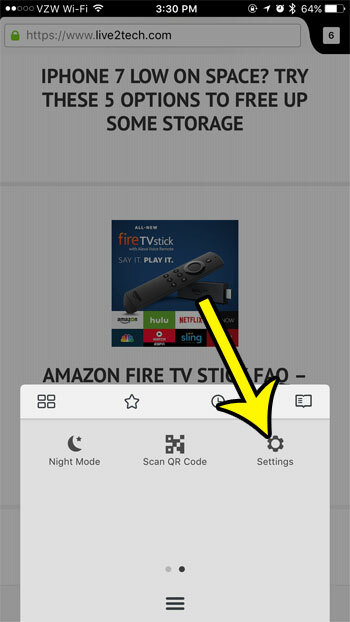 The steps in this article were performed on an iPhone 7 Plus in iOS 10.3.3, in the most current version of Firefox that was available when the article was written. This guide specifically focuses on deleting cookies, but you will also be able to delete additional information as well, such as your browsing history, cache, and offline website data. Step 2: Swipe down on the screen to bring up the bottom menu, then tap the icon with three horizontal lines. Step 3: Swipe left on the menu, then tap the Settings button. Step 4: Scroll down and select the Clear Private Data option. 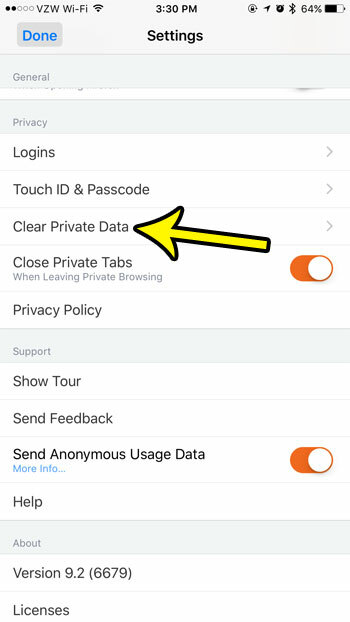 Step 5: Configure the buttons on this screen until the types of data that you want to delete are selected, then tap the Clear Private Data button. 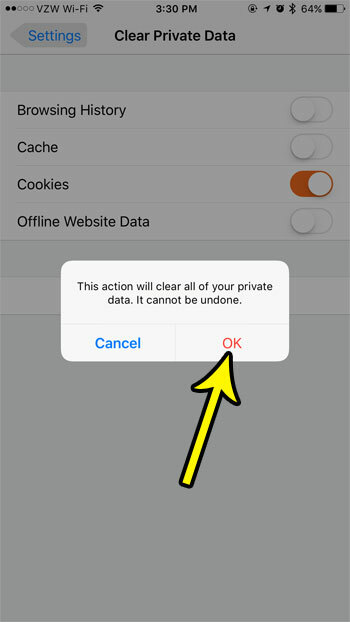 Step 6: Touch the OK button to confirm that you understand that you are permanently deleting this data. Read our guide to deleting iPhone items if you are running low on space and need to free up some storage on your device.